Whales are spectacularly specialized mammals that seem perfectly adapted to their marine habitat. Plenty of other mammals have gone back to the water, but whales take it to a whole new level. No back legs, weird ear bones, nose on top of the head. What could the land-based ancestor of whales have possibly looked like? 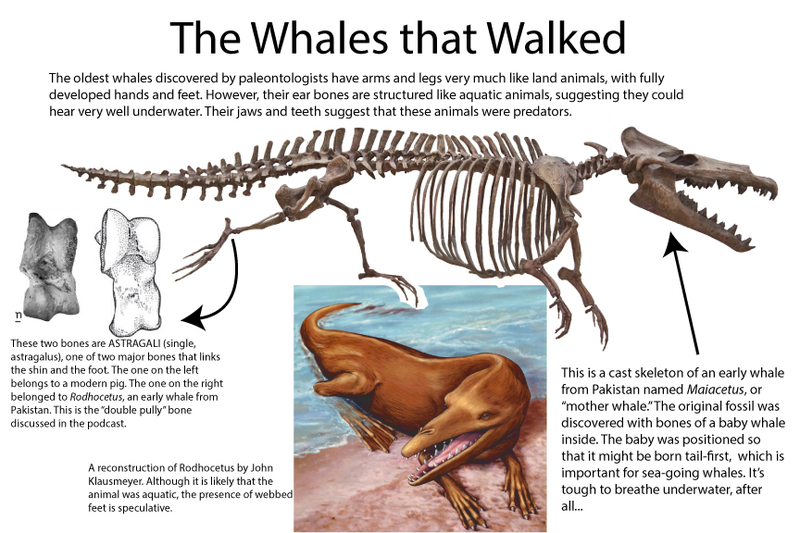 Is there a fossil record of walking whales? In this episode we discover whales belong with the hoofed animals and their closest relatives, according to molecular comparisons, are hippos! But hippos and extinct fossil whales don’t look very much alike. 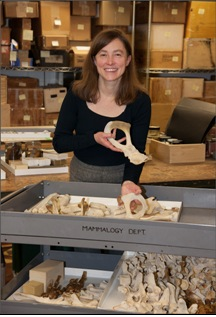 How did paleontologists, like our guest Dr. Marueen O’Leary, figure out the origins of whales? And what do we know about the origins of hippos? As always when we start digging into the fossil record the answers to these questions lead to even questions than we started with! Click here to subscribe to the podcast on iTunes. If you like what you hear, or if you don’t, leave a review! We really are looking for feedback on what we’re trying to do here. If you would rather stream the episode through your browser or download the audio without going through an RSS feed or iTunes, click here! 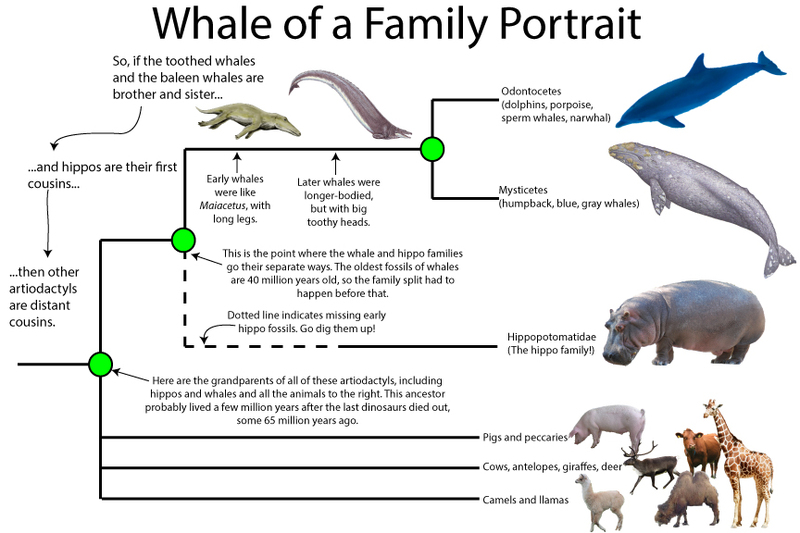 Click below to expand the Field Guide to see images of the earliest fossil whales and a tree showing where whales fit in the mammalian family tree! Whales are strange animals. For centuries whalers and fisherman knew there was a difference between the “great fish” with horizontal tails and lungs, and the other, smaller fish with vertical tails and gills, but it wasn’t until the 19th century when scientists first started studying the remains of fossil whales that they started the search for the closest living and extinct relatives of Cetacea (the group that includes all living whales) among living and extinct mammals. Scientists over the last two hundred years have posed and tested tons of hypotheses (they are whales, nothing is going to be small). Each new idea adds a little more to the bigger story of these gigantic mammals. Thankfully, we have an expert, Dr. Maureen O’Leary, to guide us through the hypotheses that have been proposed, shot down and supported through two centuries of work. University. Dr. O’Leary started her career studying the anatomy of ancient mammals, charting the relationships of those mammals using similarities in their bones. Using cutting-edge techniques, Dr. O’Leary is now able to combine information from bones and fossils with evolutionary information contained in organic molecules like DNA. She’s excavated fossils in the American west and in North Africa. She currently leads a massive project called the Mammalia Tree of Life which is a collaboration among dozens of scientists to sort out the relationships among ALL mammal groups. We’ll be talking to Dr. O’Leary about the Tree of Life project in a few weeks. First, we wanted to pick her brain on whale evolution since this is a special area of interest for her and the story of whales can be fit into the larger story of mammal evolution. Step 1 – Discover Fossil Whales! Harlan brought the Gulf Coast fossils to Sir Richard Owen, a British anatomist who ran the Natural History Museum in London. Owen was an opponent of Charles Darwin and all evolutionary theory. He also coined the term “dinosaur” for the large reptiles that were being found in England and Continental Europe. The cantankerous Owen really knew his animal anatomy, though, and he recognized Basilosaurus as a mammal based on the multiple roots on the teeth and the anatomy of the jaw. 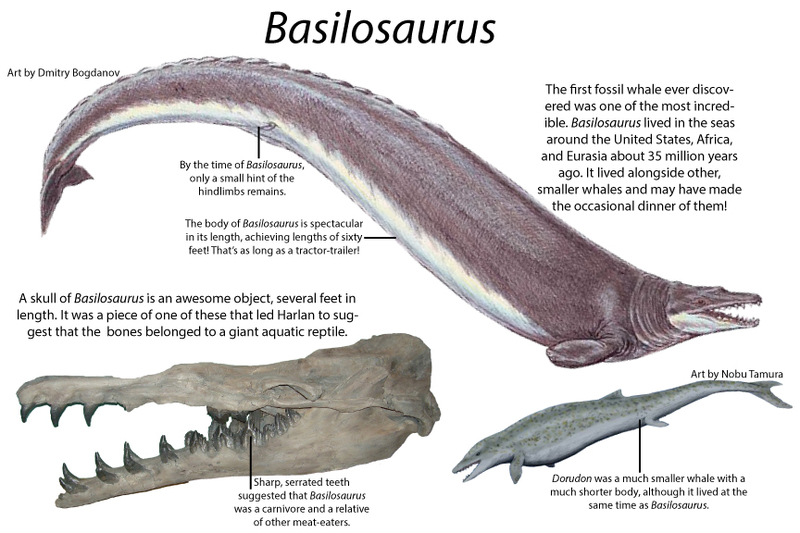 He noticed there were many features of the skull that placed Basilosaurus with the modern whales. Even if he didn’t think there was an evolutionary explanation for the strange animal, Owen’s conclusion that Basilosaurus was a kind of whale was further supported by the discovery of more compete fossils of the sinuous beast. 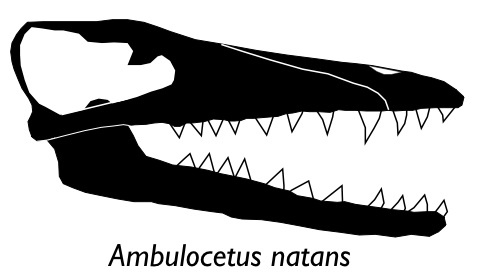 The terrifying teeth of Basilosaurus and other early whales discovered throughout the nineteenth and early twentieth centuries suggested a connection to some kind of deadly mammalian carnivore, perhaps dogs or bears. Modern pinnipeds (seals, sea lions, and walruses) are close relatives of bears. Maybe whales were really marine adapted seals! But the more anatomists scrutinized the anatomy of whales and the anatomy of carnivores, the less likely this seemed. The largest mesonychid is called Andrewsarchus. Known only from its massive cranium, it may have been the largest carnivorous mammal to live on land. It was big but was it the cousin of the whales? Discoveries of complete fossil whale legs in the 1990s showed that the oldest whales had the very same ankle structures as the oldest artiodactyls. All tetrapods (land animals) have an astragalus, the bone that acts as a hinge between your lower leg and your foot, but only artiodactyls have a “double pulley” astragalus. Mesonychids don’t have a double pulley, but the oldest whales ever discovered were preserved with their hind legs intact and they had the double pulley, a feature that linked whales to sheep, cows, camels, and deer! Also in the 1990s, biologists began to use molecules to provide a brand new window into the relationships of organisms. Scientists can only study the DNA, proteins, and other molecules in living or very-recently dead animals, because fossils don’t preserve the living tissues that house genetic information (so no Jurassic Park for a while). Still, the molecules of living animals can be compared to one another using massive computers. The more similar the molecules, the more likely two animals are related. Sometimes the molecules can reveal connections that have gone unsuspected by zoologists and paleontologists because there are still gaps in the fossil record. When molecular research turned to whales, molecular biologists discovered a strange relationship: whales’ molecules had more in common with hippopotamus molecules than any other living mammal! Paleontologists and anatomists figured out that whales and the artiodactyls were close relatives based on the ankle bones, but no one guessed that whales were close to any particular group of hoofed mammals, let alone the herbivorous, snub-nosed hippos! Look at the image of the Walking Whales above. Compare that to a hippo below. What would the common ancestor of these two animals looked like? But the evidence for the hippo-whale connection continues to pile up. We’ve come a long way from Harlan and his “King Lizard.” But the hippo hypothesis leaves us with a multitude of questions! Like, what do the earliest hippos look like? Were they semi-aquatic like they are today? Did they have sharp teeth link the earliest whales or were they herbivores? Can the fossil record help solve the mystery? Unfortunately, we don’t have any of the oldest hippos! It’s a strange place to end the story, but the fact is we need fossil hippos to tell the whole story of the origin of whales. Will a paleontologist dig up that ancient hippo tomorrow? Next summer? Will you be the one to find it? Whales: Giants of the Deep at the American Museum of Natural History in New York City – If you’re in the New York area, check out this spectacular exhibit at the American Museum. You can crawl through a life-sized model of a blue whale’s heart, see reproductions of the earliest-known fossil whales, and even the skull of Andrewsarchus! The exhibit also explores the relationship between people and whales through time. If you’re not in New York, keep an eye out for this exhibit to visit your town. It was created in New Zealand and has already been to Chicago. At the Water’s Edge by Carl Zimmer (1999) – Zimmer starts by describing the complicated story of early tetrapod evolution as fish learned to walk, then he describes the return to the water with the story of early whales. Return to the Sea: The Live and Evolutionary Times of Marine mammals by Annelisa Berta – Polar bears, seals, otters, manatees, and whales all made it back to the water and Berta describes what is known about each lineage’s return to an aquatic lifestyle. An Introduction to Marine Mammal Biology and Conservation by E.C.M. 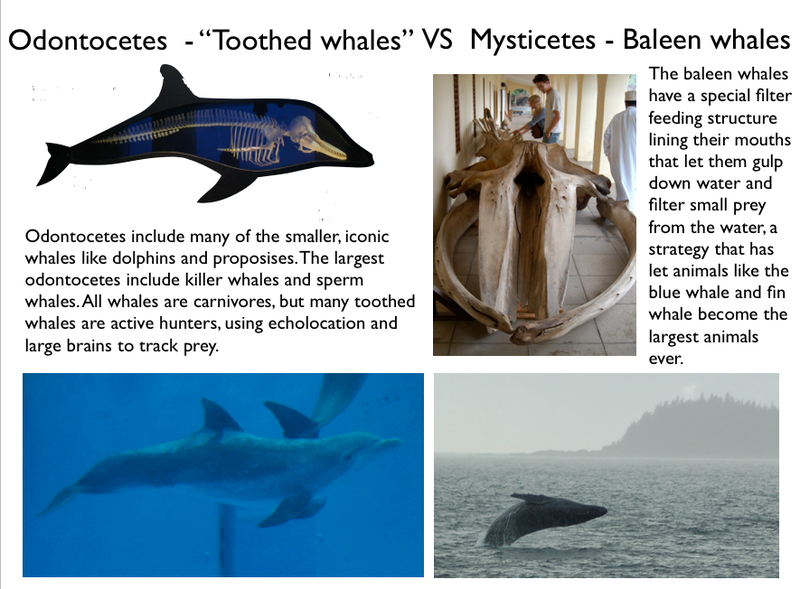 Parsons – A discussion of the behavior and biology of modern marine mammals.